Plugins are the clockwork of your WordPress website. Want to make your site perform some really cool function? There’s a plugin for that. Plugins are bits of code programmed to perform a specific function. The following list contains my go-to plugins for optimal site function. The free version of Askimet comes with every WordPress install; all you have to do is activate it. (It does require a free WordPress.com account.) Askimet protects your blog from those annoying spam comments so that the only comments you have to worry about are those from people who truly want to engage with you. Jetpack is another plugin that comes with your WordPress install, and it offers many functions. It offers several function options for your site in the categories of writing, discussion, sharing, traffic, and security. It’s a great mutli-tool for beginning bloggers and website owners. Yoast SEO is the first plugin I install when launching a new WordPress website. It makes improving your search engine optimization so easy. It judges your content on the strength of your chosen keyword and the readability of your content and shows you clearly what you are doing right and where you can improve. You can even use Yoast SEO to craft custom Facebook and Twitter posts for sharing your blog’s content. If you are going to have a blog on your website, you’re going to want TinyMCE Advanced. This is a plugin strictly for your website’s backend as it allows you to customize the formatting toolbar in WordPress’s text editor. With this simple tool, you can control your text’s font sizes and styles, among many other functions, right in the editor, without having to alter your site’s CSS. Updraft is another one of those plugins that should be installed immediately with every new WordPress install. One of the (many) awesome things about WordPress is the fact that you can back up your entire website. Those backups are vital if your site ever goes down irrevocably. Updraft is an automatic back up and restoration plugin. Use it so that if the unthinkable ever happens, you’re prepared. Site security is super important. We hear news stories every single day about how hackers are exploiting weaknesses in websites and cyber systems to gain access to vital private information. But hackers are also exploiting weaknesses in smaller sites, often just because they can. So your security choice is important. But don’t just take my word for it: Check out this article that details all the functions of WordFence. Just like everything else, your WordPress website can slow down due to a build-up of digital detritus. WP Optimize helps keep that detritus to a minimum making sure your site runs quickly and smoothly. Smush goes hand in hand with WP Optimize in keeping your site running smoothly. Smush optimizes your images so they load quickly and don’t weigh your site down with extra, unnecessary data. Very important for keeping your site’s load speed down and keeping visitors on your site. 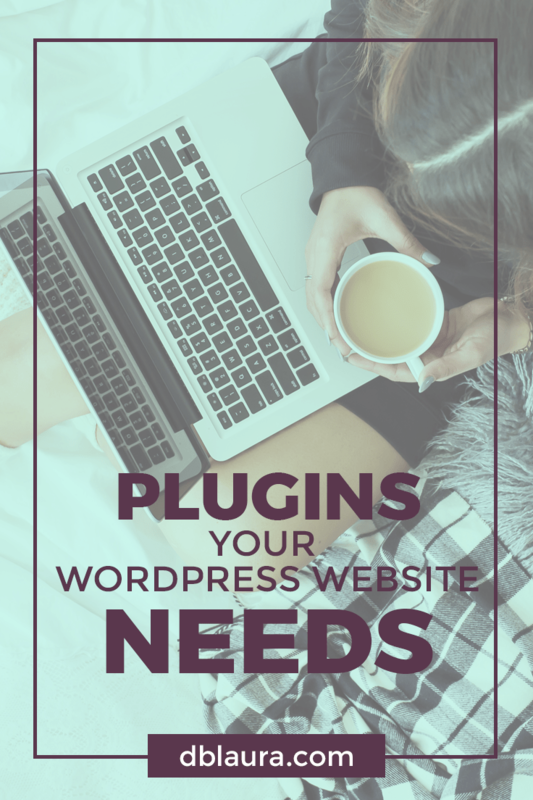 There are a lot (read: A LOT) of plugins to choose from when building your WordPress website, at least one for every function you can think of. But those listed above will give your website a headstart on working hard for you. LIKE THIS? JOIN THE FACEBOOK GROUP!